The style in which the IRONMAN World Championships are won varies based on the type of athlete(s) who are threats or have shown they can win the race in a particular fashion. We typically refer to this as the bikers or the runners era. As triathlon evolves, the competition becomes more dense. There are a lot of athletes that might not be able to win, but can still influence how the dynamics unfold. In Part 1 of this series, we discussed the overall planning of making it to Kona. This article will focus on how we prepare for the Kona bike. The main thing that I’ve seen the last few years in the men’s race is the increasing number of athletes that are willing to throw it all out there on the bike. Athletes are sacrificing fast marathons with a strategy of making the bike so hard that you limit those who can be in contention out of T2. Then, athletes who can run a 2:50 marathon will be in contention for the podium. Having a fair idea that the race will unfold in a similar manner as it has in previous years, we can develop race specific training sessions to prepare for this. Step one is to make the front swim group. Unless your name is Sebastian Kienle, the likelihood bridging to the front group is small. You might be able to get there, but you’ve burned a lot of matches to do so. Although the front group is the optimal position to start the bike, you have to be smart. Starting the bike with 20 to 30 amped up men riding with their hair on fire isn’t the ideal pacing strategy. The effort is highly variable as athletes jockey for position along the Queen K.
It’s in this first 35 to 50 miles where athletes ruin their days. They feel that being in the front group is so crucial, they will hang on at all costs…that is until they can’t. If you hang on too long and blow up, you will lose time in droves as you limp back towards T2. Riding well in Kona is about being strong on the back half of the race. This is where all the time is lost or gained. Queen K: Train specifically to minimize the impact of the variable pacing. Hawi Climb: Your day’s best sustained power. Hawi Descent: Condition dependant…stay aero and go with the flow. Queen K: Steady and strong during the last hour of the race. A quick review of power files from top pros shows this clearly. In the women’s race, you’re starting to see the creation of a front group. In 2013, the woman’s pack stayed together most of the ride only breaking up towards the end. Last year this pack formed, but then split off in two’s and three’s as the girls fell off the pace. As you see in the men’s race, the woman’s group will push the bike to distance themselves from the weaker swimmers and fast runners. There is a similar give and take where the women will sacrifice their best marathons in hopes of creating more space on the bike. This has not worked over the past two seasons as Mirinda Carfrae has put down two incredible marathons to win the race. I predict this year will be very similar to last year. I use a similar training strategy for Liz as I do Callum except for the pace variability. I’ll have Liz keep the power constant because the women’s race is hard at the beginning, but less variable because of the smaller numbers in the group. The breakdown of the importance of each section of the course is the exact same as in the men’s race. I want Liz to be in that front group and stay there as long as she’s not compromising the last hour of the bike in doing so. I’d rather Liz limit her losses and let the group go so she can time trial along the Queen K at her own pace. Liz knows she races best staying steady all day long. That is her fastest race from point A to B. But, it’s not always that simple as there is a huge mental component to IRONMAN racing and the group is a very motivating factor. The bike is where pro race, particularly on the men’s side, differs from the age-group race. What I described above sounds like a terrible pacing strategy…and it is. No one prefers to race that way, but everyone does. It’s a panic under crisis mentality. Ask most pros what they think about the bike and they’ll tell you it’s ridiculous how everyone races. 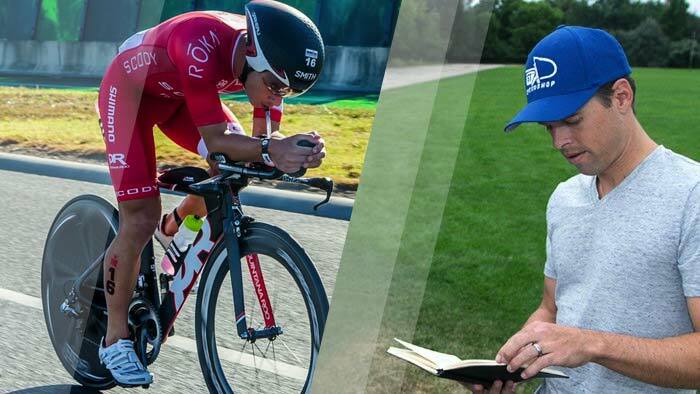 A pro athlete needs to organize their training to reflect how the race will unfold. A key IRONMAN bike session for an age-group athlete will include a lot of time just sitting between .65-.75 percent Intensity Factor®. A ride like this for a pro athlete, although good training, has zero resemblance to the demands of their race day. I think it would be a very demanding sessions for a pro athlete to try and simulate the Kona bike ride, so I break it up into two sessions. This session preps Callum and Liz for the first part of the race. For Callum, I have him hit the intervals with more spikes in power to simulate race day. For Liz, these efforts are more steady state. This is the second session and used to prepare them for the back half of the bike course. 4 to 5 hours steady while climbing in the mountains near Boulder. It can include some slow RPM work. In the two sessions describe above, notice the first ride is done at Half IRONMAN effort and the second session done at IRONMAN effort. This split does a good job of replicating the first half of the course and the back half of the course. Both deserve equal attention because you first need to arrive at the last hour with the ability to ride strong there. The last hour of the race is typically the lowest power for most competitors and it’s been shown that if you’re strong here you can put yourself in a good position for the podium with a steady marathon. I don’t think there are any secrets in Kona. It’s easy to state your intentions and announce your race plan or strategy. I can tell you the race strategies of basically every pro athlete towing the line. Race day is not a magic day. Race day is a day where you hope that you can get the most out of yourself and execute as you have in training. It’s not a day where set out at an unrealistic pace and “hope” that today will be your day. You can either make good decisions and execute with what you have or you can gamble and hope for the best.